In Episode 1 we learn how to think about emergency preparedness in a new way, what disasters you should prepare for, and how to create a family communication plan. 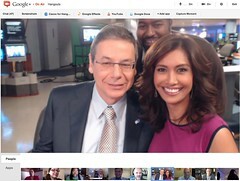 It was my great pleasure to G+ Hangout with Israel’s Deputy Foreign Minister+Danny Ayalon (Wikipedia) hosted by +Maria Quiban +Tshaka Armstrong at+myFOXla / FOX Los Angeles. The following is my question to Mr. Ayalon (I added a few words to give the readers some context). Question: I understand you just attended the Jerusalem Post conference [in New York on Sunday Apr 29th]. And I’ve watched a video of sparks flying between Environmental Minister Gilad Erdan, and Meir Dagan, former chief of Mossad [national intelligence agency of Israel]. My question is about your view on the idea of an Israeli pre-emptive strike of Iran. Do you agree with Meir Dagan that [I paraphrase] “War is the the kind of thing where we know how it starts, but not how it will end” and Israel should exhaust all other means first before considering war? The following are part of the research materials I gathered in order to ask an informed question. I tried to be as fair and as diplomatic as I could when asking my question without losing anything important in my question. “Keinon [Jerusalem Post’s diplomatic reporter]: But do you think it’s appropriate for him to make those kind of comments? He could have made them when he was the head of the Shin Bet (the Israel Security Agency)? Dagan: First of all, I think he presented his position loudly and clearly about his refusal to the prime minister and defense minister. He didn’t announce it. It was in a closed room. To speak openly? (Turning to Gilad Erdan) I heard that a member of your party is now formulating a law… on behalf of my name, Dagan, preventing ex-people of the military and security establishment from speaking. Let me remind you of something, sir, what was started in Germany in the beginning. You know how you are starting it; you don’t know how it is ending. About Diskin, I believe that he is a very serious man and he is presenting a very serious point of view. And I know that serious point of view was presented to the prime minister and defense minister on many occasions. […] Erdan: Thank you very much, but I know that the Shin Bet is under the Prime Minister’s Office. (laughter) I also used to work there 15 or 16 years ago. But the minister of defense still works together [with the prime minister], and if Yuval Diskin thought the prime minister was doing things so dangerous for the future of Israel, so in order to save Israel, he should resign, and not wait five years as head of the Shin Bet and then even agree to serve one more year. Dagan:It’s not true. (boos) You are lying, sir. I am maybe not polite, but I prefer ministers of the State of Israel who speak the truth.